Members of No. 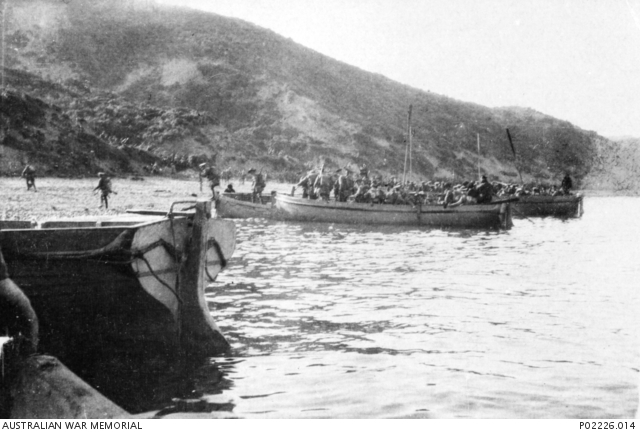 2 Field Company, Royal Australian Engineers, land on the beach at Gallipoli, 6.30am 25 April 1915, Cyril Oscar Lawrence. 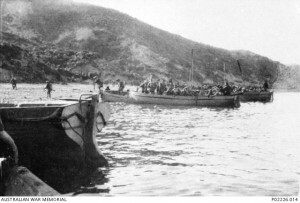 The Mediterranean Expeditionary Force consisting of 70,000 Australian, New Zealand, French and British soldiers invade the Gallipoli peninsula. Australians and New Zealanders account for 15,000 of the 70,000 troops. The peninsula is heavily defended by well-armed German-trained Turkish troops; a stalemate develops as the Allies fail to gain ground and the Turks attempt to drive out the Allies. The situation evolves into an eight and a half month long stalemate. 747 Australians die on the first day, including Eric Martin Solling and Herbert Maurice Robertshaw from Orange. During the first nine days at Gallipoli the ANZACs suffer almost 8,000 casualties, with 2,300 dead. Total Australian casualties at the end of the Gallipoli campaign are: 7,823 killed, 19,441 wounded, 569 dead from disease and 31 dead due to accidents. It is estimated that about 70 men from Orange served at Gallipoli; 29 of them failed to return. 25th April was officially named Anzac Day in 1916. In an attempt to deflect attention from the Allied invasion, Lieutenant-Commander of the Australian Navy submarine AE2, Henry Stoker, receives orders to penetrate the Dardanelles, sink any mine-dropping vessels encountered and ‘run amok generally’. The AE2 becomes the first Allied warship to successfully penetrate The Narrows and enter the Sea of Marmara. En route she torpedoes and sinks a Turkish gunboat. This entry was posted on April 25th, 2015.